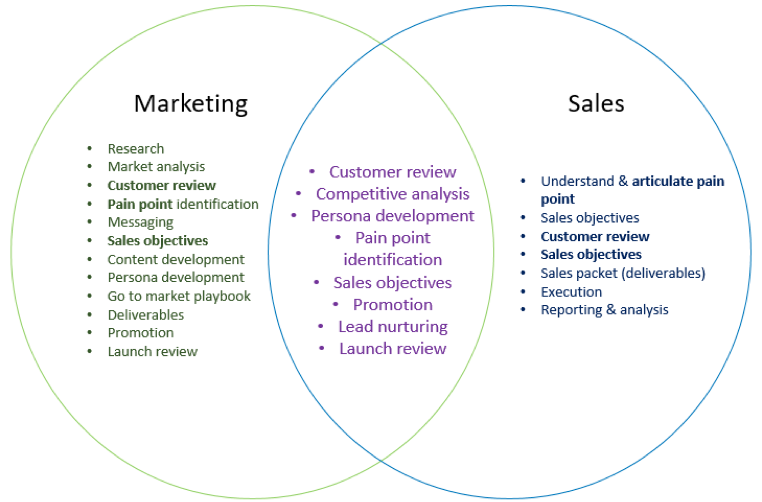 Sales and marketing are two distinct and separate disciplines. However, both are equally necessary to produce a successful go-to-market initiative. Step one. Make marketing and sales leadership aware of the upcoming launch and agree on business goals surrounding the product. Step two. Define roles for both teams and agree on timelines associated with the launch. Step three. Detail all responsibilities and identify crossover components where marketing and sales should collaborate. Step four. Review, evaluate and discuss on an ongoing basis. Consider this scenario. Your vice president of product management informs you of a new product or service line soon to be released from development. Your high-powered marketing team enthusiastically drives forward and begins the hard work of strategic planning for the launch. Your checklist includes research, buyer personas, pricing, value proposition, market analysis, promotion development, content marketing, SEO, PR, branding and a strong communication strategy. Months of hard work and considerable effort and expense are undertaken to ensure a successful launch. The marketing team shares, with great excitement, the outline of the new product and go to-market-plan with sales. Product education is conducted, resources are identified, objectives and goals are communicated. But wait–there’s a problem! Enthusiasm for the launch turns into frustration, backtracking and gridlock– what a disaster. Does this sound familiar? The most efficient way to mitigate these product launch problems is to facilitate an inclusive environment from the start. The goal is to align both sales and marketing behind a strong go-to-market plan. This ensures that once the product or solution is launched externally to the market, everyone is prepared and excited to support it. By identifying the commonalities for joint participation and defining alignment between sales and marketing, you prevent marketing from working in a silo and encourage sales to become an enthusiastic supporter of the launch. Best practices for driving commonalities and building a successful product launch include the following four steps. There are four stepping stones to create successful sales and marketing collaboration. Establishing regular group meetings helps solidify your new team mentality and ensure that everyone agrees and understands the market strategy, messaging, value proposition, communication plan and tactics before your launch date. Ensure your communication and tactical marketing approach align with and complement existing sales process. Even the most viable offering, with a different process, may underperform due to inefficiency. Establish clear goals and measurements. Publish and report on these for the entire organization. Although this new process may add a little more time in the beginning, working out all the challenges up front helps you to transition from a departmental mindset to a fully-engaged company launch that will be enthusiastically supported by all departments and accepted externally by your market. Former VP of Marketing for CIOX Health, Catherine Valyi is President of Strategic Marketing Solutions. She helps transform one-dimensional, tactical marketing into content-rich, strategic, lead generating programs designed to support sales activity and fuel growth initiatives. Get to know Catherine more by clicking here. Bill Matits is a former sales excutive at HealthPort Technologies. He is a distinguished sales and key account management professional with experience providing focused mission building, strategic planning, and creating compelling client value in the areas of BPO, healthcare technology solutions and services. Get to know Bill more by clicking here.